Try Axe Throwing for a Father’s Day gift dad won't forget! Father’s Day is just around the corner and we’ve got a gift idea that he’ll actually like! 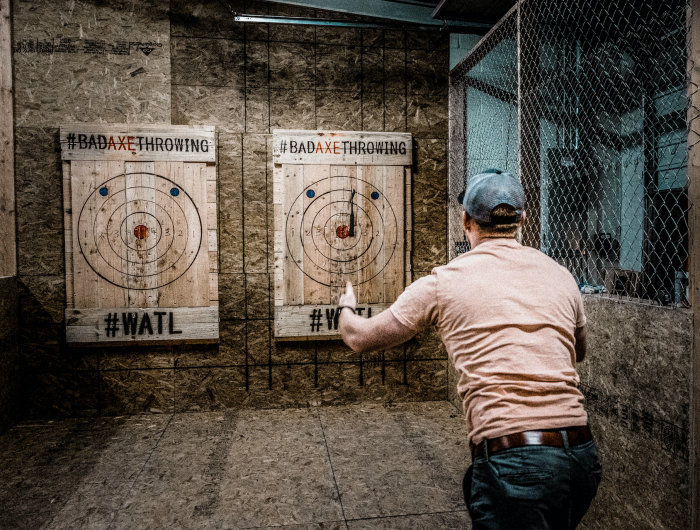 Whether you’re looking for a great gift from a daughter and son or you need a special Father’s Day gift for your husband, he’s bound to be thrilled to unwrap a Father’s Day Axe Throwing experience at Bad Axe Throwing! June 17th is Father’s day, meaning it’s close enough that you should start putting some thought into it, but far enough that you still have time to figure out just how you’re going to surprise him. Bad Axe Throwing offers the unique experience of learning to throw axes! We have 18 locations across Canada and the US including Toronto, Winnipeg, Ottawa, Chicago, Denver and Atlanta. There’s bound to be a location near you! Bad Axe Throwing offers a one of a kind experience for your Father’s Day gift! Professionally trained axe throwing coaches will teach him how to throw axes in a safe and fun environment. He’s probably used an axe before, but never in this context! This gift idea is great as it’s totally unique, something he’s probably never done before, and it’s an opportunity to spend some quality time together! With the click of a mouse, gift certificates for Bad Axe Throwing are easily available for purchase! You’ll be emailed the gift certificate so you can print it off and gift it to him! Bad Axe Throwing t-shirts, hats and medals are also available to purchase so he can look the part while learning to throw like a lumberjack! The options for the axe throwing experience vary and appeal to all types of Dad’s out there! Book an event for the boys in the family, an event for the whole family or use the gift certificates for weekly walk ins! Whichever option you choose, we know he’s going to be excited to experience the thrill of axe throwing!